A working group made up of senior managers and experts from national tuberculosis (TB) programmes (NTP), ministries of health and social health insurance agencies held its first face-to-face meeting on 27 October 2014 in Barcelona, Spain, to review bottlenecks, opportunities and progress in health financing reform of TB prevention and control interventions in the WHO European Region. The meeting was hosted by the WHO Barcelona Office for Health Systems Strengthening and focused on impacts and lessons learnt related to payment mechanisms. 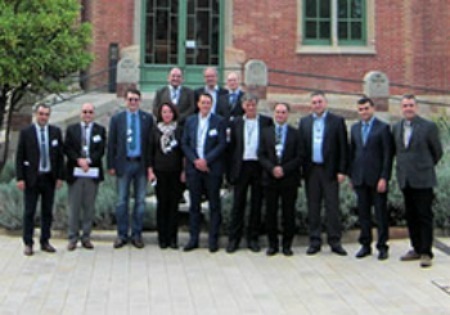 In line with implementation of the Consolidated Action Plan to Prevent and Combat M/XDR-TB 2011–2015, the Wolfheze group/NTP managers under coordination of WHO/Europe established the working group in May 2013 with core members for a pilot phase chosen from Armenia, Belarus, Hungary and the Netherlands. – application of performance incentives and patient support in primary health care in Belarus. The case studies will be finalized in a coming report that will be presented to the Wolfheze Workshops in 2015. The working group also clarified effective ways to roll out the health account production tool based on System of Health Account 2011.
WHO technical officers contributed to the meeting with presentations and inputs to the discussions. A high-level delegation from Uzbekistan including the first deputy Minister of Health and the vice-speaker of the parliament in Karalpakastan took part as observers.